What is a Fair Share? One of the Left’s favorite memes is telling people that everyone should pay their fair share of taxes. Of course they can never define what a ‘fair share’ is and it’s no accident we never see people like Elizabeth Warren tell us exactly what she means by this term. If they told us what their real definition was it would frighten people because they basically want more tax revenue until there are no more wealthy people and we are all poor and dependent on the Government. There are two measurements that I’ll use to formulate my ‘fair share’ definition – Adjusted Gross Income (AGI) share percentage and Total Income Tax share percentage. These terms are reported annually by the IRS and are broken down by income demographics (Top 1%, 5%, 10%, 25% and 50%). The IRS reports how much of the total US AGI is accounted for in each income demographic and how much each income demographic pays as a percent of overall income tax for that year. So my definition of a ‘fair share’ is this – Each income demographic group should pay a percentage of total income tax that is equivalent to their corresponding AGI percentage. In other words – If you are in an income demographic group that accounts for 20% of all income in the US then your total group should account for 20% of all income taxes collected. Sounds fair, right? Your percent of the income tax is equal to your share of the income. Side Note – This definition is not the same as a Fair Tax system and while I’m a big proponent of this, we don’t have that now so I’m attempting a definition of ‘fair share’ that works with our existing progressive income tax structure. Ok, now let’s dig into the data and see how close we come to my ‘fair share’ definition. And in an interest to fully disclose my data source – I use the IRS website to obtain the particular spreadsheet that I need to generate the graphs you’ll see below. Tax year 2010 is the latest data the IRS has published so that is what I’ll be using here. I did a similar analysis with 2009 tax data and you can go here if you are interested. 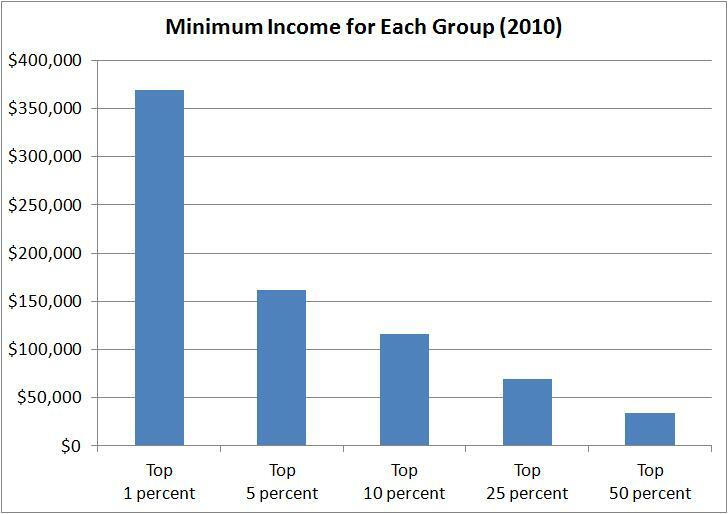 Here is a graph showing how the various income demographic groups are divided in 2010 based on the minimum annual income (in 2010 dollars). 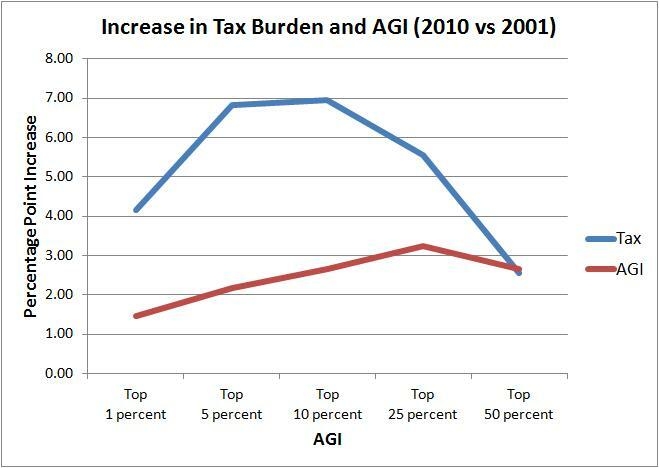 Now let’s look at the percent of AGI for the top 3 income demographics over the past 10 years and you can see that the top 1% accounted for roughly 20% of the total AGI, the top 5% accounted for around 35% and the top 10% accounted for around 45%. 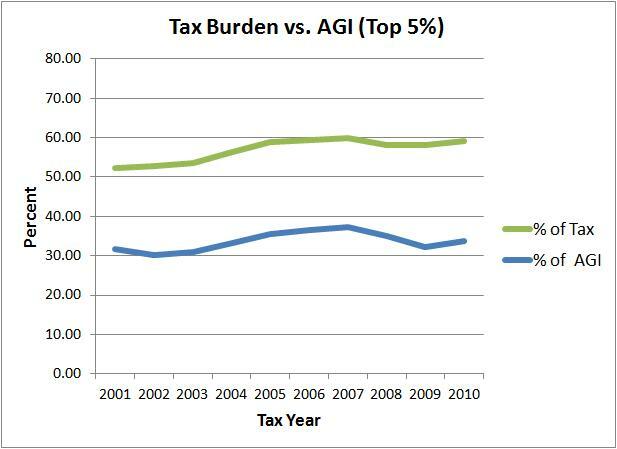 If my definition of ‘fair share’ is correct then the amount of total income tax by these three income demographic groups should be about equal to their AGI percentages (20% for the top 1%, 35% for the top 5% and 45% for the top 10%). Wait a minute! These income demographic groups are paying almost twice their percentage of tax revenue when compared to their AGI revenue. How can Leftists say they aren’t paying their fair share? The IRS data show that they are paying much more than their fair share! 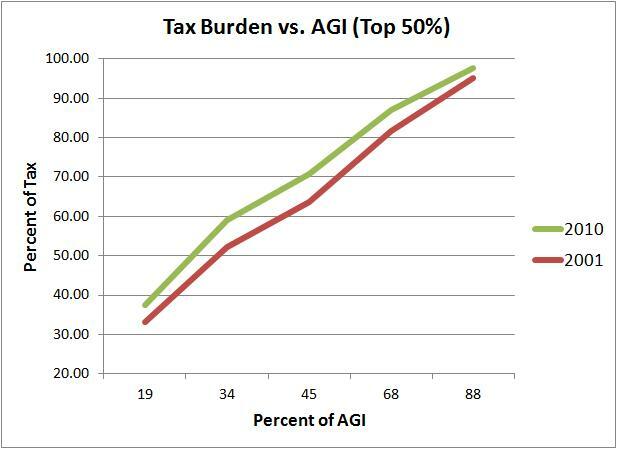 To show it another way, I’ve graphed the AGI percentages vs. Tax percentages of the top 50% for 2010 and compared that with what the graph should look like if we used my definition of ‘fair share’ (Tax percentage equals AGI percentage). 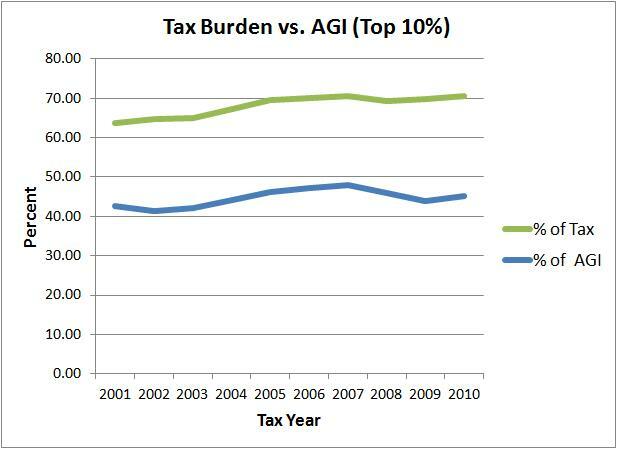 When you look at a graph over the past 10 years (comparing 2001 with 2010) comparing AGI share with Tax share, you see that we are moving in a direction of more unfairness (each income demographic is paying a bigger share of the Tax revenue that doesn’t match their AGI share). 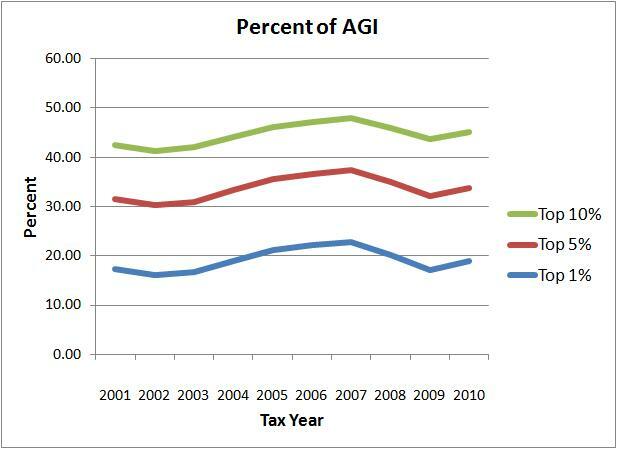 It looks even worse when you look at each group and compare how much their AGI share increased versus their Tax share increased from 2001 to 2010. 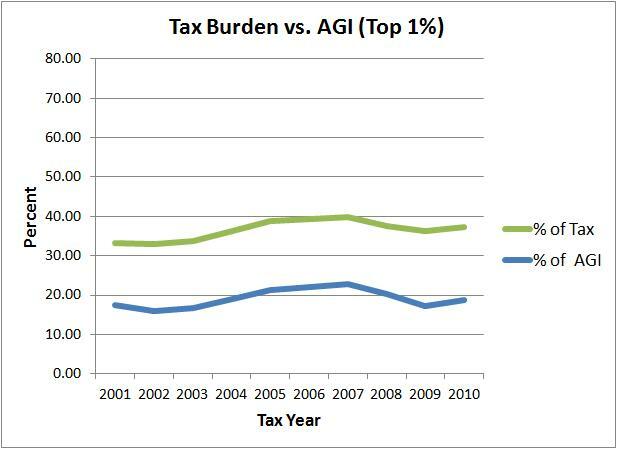 The top 1% saw their AGI share increase by just over 1.5 percentage point from 2001 to 2010 but their share of the Tax revenue increased by over 4 percentage points! Doesn’t it seem ‘fair’ that when your share of the total more income increases by X percentage points that your share of the income taxes shouldn’t increase by more than X percentage points? Apparently not for Leftists! There is no way you can honestly look at this data and tell the American people that the wealthy aren’t paying their fair share. Any attempt to do so reveals that you are either ignorant of the data or have a more insidious purpose. Or both. 12 Responses to What is a Fair Share? Cosmo, the flaw in your presentation is that you are trying to use common sense, backed up by undeniable facts. Surely you realize that “fair” to the Left means something COMPLETELY different to them than it does to the Right. Once we all accept that “fair” means we are, as you say, ALL poor and dependent on the Government, the world will be more idyllic to the Left…..
Nice post, Cosmo! And you KNOW how much I enjoy it when you whip out the graphs! As you know (and I’ll echo my good buddy, PGH): the Left has no ability to think rationally or with common sense. That’s because they would classify common sense as some sort of social construct, like gender roles. That’s why they greet news of AGW (as you enjoy pointing out here) with shrieks, like vampires to sunlight. There is no actual truth, merely what they believe to be true at the time. In their Utopian views, taxes must be stacked onto the “rich” as the ones who have benefited at the expense of others by some cosmic quirk of fate, and not by the dint of their own effort (as you alluded to with your Elizabeth Warren reference). Guaranteed: they would look at your facts above with a glazed look, like a dog being shown the sports page. They’d see it, but wouldn’t be able to recognize its actual significance. Used press this to invite my readers to your blog. Great article. Thanks so much for the positive publicity! Rick has always had a very interesting and rather eclectic blog: definitely worth a follow, and I say that as a follower of BOTH of you guys. I’ve enjoyed Rick’s comments here and I’m now following his blog and twitter feed! Look forward to more nteractions with him. Thanks for the recommendation! The repeal of the estate tax, one of the largest revenue measures in EGTRRA, will cost more than $53 billion when fully phased in (JCT 2001). The provision almost exclusively benefits taxpayers with very high incomes; it only affects those who have assets worth more than a million dollars at the time of death. Including the estate tax repeal raises the percentage increase in after-tax income for individuals in the highest adjusted gross income class about two-thirds and raises their share of the tax cut from 37 percent to 46 percent (table 5). I’m going to echo Pgh’s thought below, but in a slightly different way. An argument can be made as to the necessity of Income Tax, since the Government needs to be able to run the country, etc.,… If you argue that in order to earn a living, someone could be said to be taking advantage of various forms of infrastructure, then sure, I get that. I may disagree with the percentages taken, or how the money is collected, but the government needs SOME money in order to secure our safety (provide for the common defense), etc,.., and Income Tax (or preferably a consumption tax) seem the most logical. But to swing back to Pgh’s point: what is the moral or ethical argument for the Government’s right to tax my estate after I pass away? This money has already been taxed once, and sometimes twice: what is the rationale for taxing it yet again, other than “You’re dead, so shut up and give us your cash already”…? Rather than argue as to the percentage of a certain benefit which will be enjoyed by someone in any one bracket of the tax structure, I believe the Government’s nebulous right to this money in the first place is the more essential question. And on behalf of Cosmo’s commenters, thanks for taking the time to join in on the conversation here…. Perhaps someone could explain to me WHY the government is entitled to ANY part of my estate when I pass away? Because I was successful, and built an estate, somehow THAT entitles them to take up to half of what I’ve accumulated? I love the language that implies a tax cut will “cost” the government money, when it was NEVER theirs to begin with. Yea, I can never get behind an Estate Tax. Even if you subscribe to the fact the kids who inherit the money didn’t work for it, blah, blah…. They will still be taxes on the money once they spend it (which they most certainly will do). I’m in support of everybody paying their fair share to allow the Gov’t to do its constitutional duty but layoff the Estate Tax. Thanks, Cosmo! This whole “fair share” and “it’s the RICH who get a break if there’s no Estate Tax” are, for sure, great sound bites, albeit completely lacking in the “making sense” department. 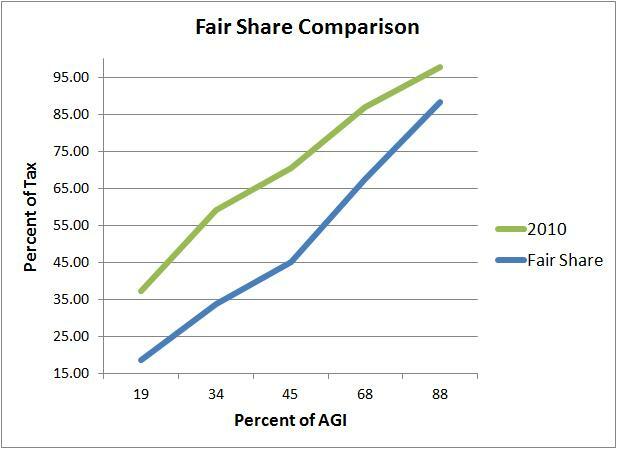 My argument to the “fair share” crowd is: What’s so fair about almost 50% of the citizenry paying NO taxes? Shouldn’t they have, as Biden stated, “some skin in the game”. Quit being jealous of those who have, and work HARDER to become one of them.